Over the last week or so Matthew and I have both been casually throwing out ideas for a future weekend getaway! The kind of trip where sandals and a good book are a must, with plenty of cold drinks and tasty meals to be had. One idea that keeps coming to mind is staying out on Long Island! We took a trip last year and stayed out on Long Island with some family, where we relaxed, explored the area and had lots of great food. During our stay, we even enjoyed a few cookout sessions compliments of our great host. I don’t think inquiring about a grill was a regular request however our host was happy to lend us the use of their grill and we were more than stoked to be grilling outdoors again! Hehe. Without having a backyard of our own the logistics of grilling out can be rather challenging. One major plus in being able to grill out was that we had plenty of roasted s’mores for dessert! 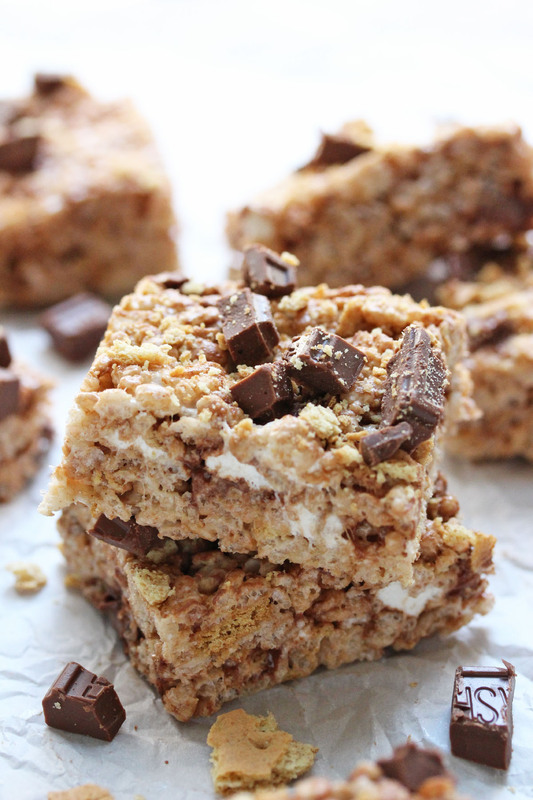 After all of our trip talks I couldn’t get the thought of roasted s’mores out of my head so I came up with these fun s’mores rice krispies treats. Perfect for that next summer adventure! Not only are these treats loaded with gooey marshmallows, crisp graham crackers pieces and chunks of milk chocolate. I went a step further and browned the butter for this recipe and added a touch of sea salt to make these over the top delicious. Line a 9×13-inch baking dish with parchment paper. Lightly grease the parchment paper. In a large bowl mix together the the 5 cups of cereal and the 1 cup of graham cracker crumbs. Set aside. In a large pot, melt the butter over medium- low heat. Stirring frequently until the butter turns a golden nut brown color and brown specks just start to form on the bottom of the pan. Remove the butter from the heat and quickly stir in 4 cups of mini marshmallows until melted and smooth. The heat from the browned butter should be enough to melt the marshmallows. If the marshmallows do not melt completely, you can place the pan on low heat until the marshmallow mixture is melted and smooth. Keep a close eye on the mixture so it doesn’t burn. Carefully pour the marshmallow mixture over the cereal mixture and mix well. Add the chocolate and 1 cup of marshmallows and gently stir until combined. Some of the chocolate and marshmallows will begin to melt and that is a good thing! Transfer the mixture into the prepared pan and using a greased spatula or greased hands evenly and firmly press the mixture into the pan. Evenly sprinkle some chocolate and graham crackers pieces over the top of the bars. Allow the bars to cool before slicing into 24 bars. Enjoy! Notes: The entire recipe will be using one full 10 ounce bag of miniature marshmallows, 4 cups will be melted in with the butter and 1 cup will get mixed in with the chocolate. You can use an 8×8-inch baking pan for thicker bars that yield roughly 9 -16 bars depending on how big you make the bars.